I’ll be the first to admit, sometimes I serve breakfast for dinner. My mother did it before me, and my grandmother before that. Every once in a long while, when the day has been long and everyone is tired and in a bad mood, it is really nice to do something fun and cheery for dinner, like serve a stack of pancakes or some scrambled eggs. Eating breakfast for dinner is the perfect comfort food and I find it restores the smiles to the faces of my family and that makes it totally worth it. Plus, I don’t stress about serving eggs or a simple warm cake because I know it is relatively healthy – far healthier at least than any awful takeout food we could find. Here are some of our favorite breakfast for dinner dishes! Nutella Baked French Toast: This is an incredibly decadent breakfast treat that makes for a sweet dinner. I know it seems absurd to serve it at the end of the day, but allow yourself to have fun once or twice a year and just do it! 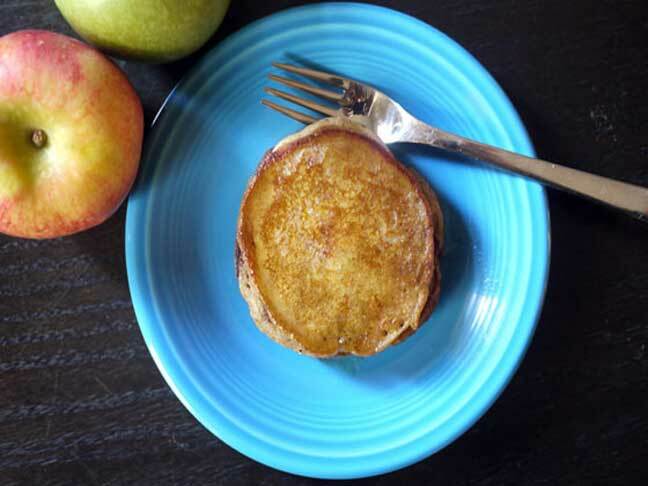 Apple Pie Pancakes: These are mmm, mmm perfect in every way. A fruit topped pancake is a great healthy dinner and is guaranteed to put a smile on everyone’s face. Rosemary Potato Frittata: This tasty egg dish comes together in a snap and can be made with almost anything you have in the fridge!